Relax in a completely refurbished Territorial on 1.5 acres in historic Corrales. Located on the northern boundary of Albuquerque, yet in a country-like setting, with incredible mountain views, horses, great golfing, and hot air balloons flying over. Ideal central day tripping location to downtown Albuquerque, Sandia and Jemez Mts., Santa Fe/Taos and rest of State. Four rooms/suite with Southwestern decor and art, private baths, spa, gourmet breakfast and scrumptious handmade chocolates. Ask about Romantic Package or having "Turtles" shipped to you. Rooms: The Turtle Suite - king with queen sleeper; Truffle Room - queen; Caramel Room - queen; and French Mint Room. Bed and Breakfast guests have the main house to themselves including a huge Great Room with views of the mountain, TV/video, etc. and a dining room set up for your convenience -- hot water at night for coffee or tea and cold drinks in the guest refrigerator. Melt in your mouth Turtles for a snack. A short drive to the Sandia Tram, Old Town Albuquerque, Bio Park (Zoo & New Aquarium and Botanical Gardens), the Indian Pueblo Cultural Center, the Petroglyphs, and several excellent golf courses. Close to the Kodak Albuquerque Balloon Fiesta Park. 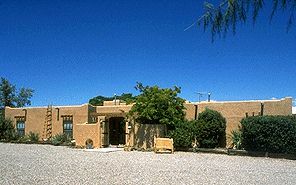 This and other Corrales Bed and Breakfast Inns can be found here in The Register.